First we must begin by saying; this is not your ordinary cooking class using electric mixers and gas stoves. 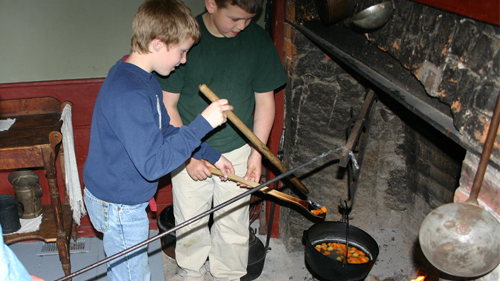 In this hands-on experience, students must first learn what types of trees create the best heat for cooking and then create the fire. Taking care their fire keeps to a constant temperature, the group will have the job of filling the wood box from an outside storage building. A full meal is to be prepared from scratch, which usually contests of soup and biscuits. As we already know, hygiene is very important when preparing a meal; care is taken to make sure hands are cleaned before working with food. As the soup is being prepared, interpreters will explain how and why these ingredients are grown on this farm and their importance in surviving a long winter, 150 hears ago. 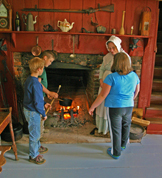 Once prepared, the soup will cook over an open fire in the fireplace, thus open hearth cooking. Just as the children have prepared the soup from scratch, so to will be the biscuits. The students will mix the ingredients and then bake them in the wood stove. As any chef will do, it is always important to sample his/her own creation. At Ross Farm, this is no different. Students can enjoy their efforts by indulging in this well prepared home cooked meal.